Pai- Fifteen years ago today the Ba’athist government of Iraq was wholly overthrown by the United States military along with its United Kingdom partners and a minute cabal of disconnected, diaspora Iraqis looking to implement various unrealistic political agendas in their home country. Today I have only images and memories left of that chaotic, strategic disaster that forever upended the Middle East’s calcified post-colonial nation-state order with little to no forethought of the dire consequences. We as a world community would not be where we are today were it not for the invasion of Iraq. I look back on this solemn image and wondered what happened to this girl. 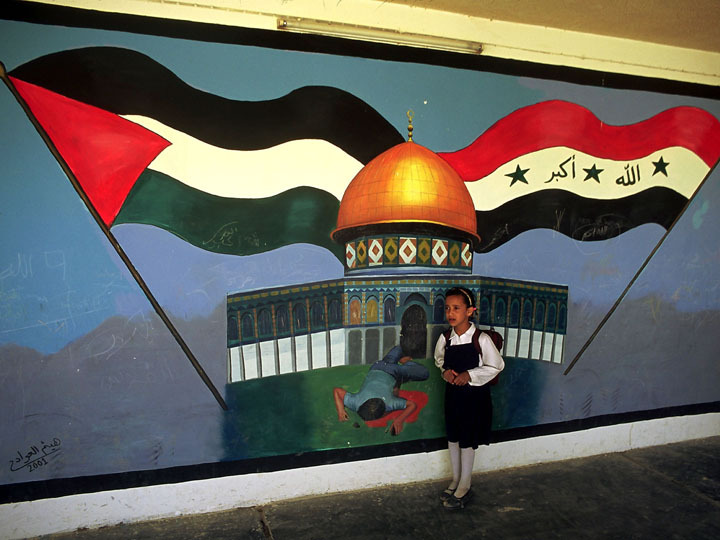 She was nervous returning to her primary school and froze in front of a mural of Muhammal-Durrah. She would be in her twenties by now if she has managed to survive years and years of mechanized and suicidal violence. I can’t ever know I suppose.